Discuss Deal or No Deal with fellow fans and contestants from the show. Also read the LIVE daily show reports of every Deal or No Deal show. DEAL or NO DEAL is the hit afternoon game show on Channel 4. The game deal or no deal is very simple to play and provides the contestants the chance to win BIG money prizes. The simplicity of the game and the high stakes provide a very dramatic and entertaining gameshow. Deal or No Deal also marks the return of TV entertainment 'legend' Noel Edmonds as the host. Deal or no deal has become so popular in the UK that the theme of the show has crossed over into other formats. For example, you can now find a bunch of deal or no deal bingo sites, where you can play deal or no deal bingo themed games. As well as bingo there's deal or no deal themed slots, roulette and scratch cards games. Fans of Deal or No Deal typically like the chance factor of the game, the ability to potentially win big whilst having fun. Online casinos offer the same benefits and you can play games such as roulette, particularly popular with UK players. There are many casino games for every type of player and a huge number of online options to choose from. Players from the UK interested in enjoying games similar to Deal or No Deal at Playtech and Microgaming sites should be visit a guide to online casino gambling that is UK player focused (like www.bestukcasinos.co.uk) for a better understanding of recommended options. If you didn't find the right casino game for you, try new bingo sites. this site pgbingo.com has special games and bonuses for beginners. We also provide LIVE Daily commentaries of EVERY Deal or No Deal show that is broadcast, so you can catch up with every show whereever you are and even join in with opinions and topics as they happen in the show... Visit our Today's Show of our DOND Forum now... There is also a full archive of all the past Deal or No Deal shows we have commentated on. Deal or No Deal's Jackpot prize of £250,000. Charlotte becomes the 38th member of the 1p Club. Alice Mundy, 21, a student and trainee Stunt woman became the 2nd winner of Deal or No Deal's jackpot prize of £250,000. In a dramatic twist to her game after already dealing for £17,500, Alice was given the ultimate gamble of giving back the £17,500 to take a 50/50 chance on going home with either 1p or £250,000. Deal or No Deal starts with 22 numbered boxes each with an unknown value of between 1p and £250,000 contained in them, these are then randomly chosen by the 22 contestants. A contestant is then chosen to play Deal or No Deal and sit in the hot seat for that game with their chosen box. They then play a series of 'rounds' where they chose to eliminate the remaining boxes one by one - hopefully avoiding the boxes containing the big money. The twist to Deal or No Deal comes in at the end of each round when the 'Banker' - a mysterious off-screen person offers the contestant a sum of money to 'buy' the box that the contestant has in front off of them and end the game. This sum of money is based on the amount of cash left in the remaining boxes. In the first round of Deal or No Deal the contestant has to open five boxes before the Banker makes his first offer. In following rounds the player only has to open three boxes before the banker makes his offer. According to the banker he bases his offers on a number of factors including what cash values remain and also how 'he' views the attitude and way the contestant is playing their game of Deal or No Deal. You normally find the first round offers are below an 'average' value of the boxes remaining which encourages the player to carry on into further rounds and add to drama. Although occasionally a tempting offer is made which does make the contestant stop to think for a while. Deal or No Deal is really a game of pure chance as no-one knows what each box contains, and all the contestants have the same chance of winning the jackpot as there are no questions to answer or games of skill to perform to win the prize. This provides a great arena for the player to interact with the host and their fellow Deal or No Deal contestants and this creates a great atmosphere and makes the show really watchable. 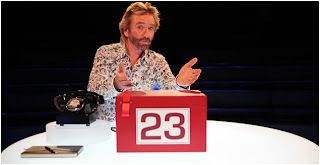 The game format of Deal or No Deal relies quite a lot on the host to build up the drama and add to the atmosphere and this is where Noel helps make the show with his interaction with the contestants and the chats with the Banker, although we only ever hear Noels side of the conversation. Noel is building up quite a collection of potential catchphrases during the show, and has most of them based around the ad breaks where he plays on the word break in his sentences. Playing Deal or No Deal although simple in concept, can also involve complex gameplay and often contestants try out various strategies or systems to try and beat the Banker. If you are looking for more novelty bet options, then visit No Deposit Monitor for no deposit bonus codes. Deal or No Deal has had quite a makeover for the New Year, both in the look and feel of the studio, and also in the game-play. 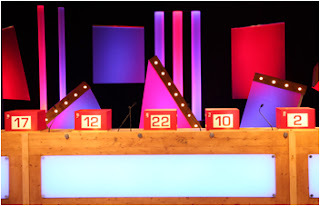 As can be seen on the image above the Deal or No Deal studio has had quite a radical makeover and now also includes 'DEAL' indicator lights next to all the contestants on the wings, so they can show whether would deal at any stage during the player's game. There is also a stats board in the studio displaying the show number, and how much the Banker has paid out in total. The biggest change to the game-play for the New Year is the introduction of Box 23. This new box adds an extra dimension to the end of game, by giving the contestant the option of buying Box 23 at the end of their game with whatever amount they have won. As you can see, this now gives the Deal or No Deal contestants a potential top prize of £500,000, but does have a big downside of going home with nothing. Will anyone ever be brave or bold enough to take a chance at gambling £250,000 to potentially win £500,000?